A deep cultural curiosity and an interest in the significance of tribal objects and music, has had a major influence on the life and career of the artist, Bob Rizzo. His work incorporates various mediums including painting, performance, prints, sculpture, set design and sound installation. He began showing his work publicly in the early ’70’s. By 1975 his work was part of the American Painters in Paris exhibition at the Palais de Congres, Paris, France. In the same year, he created his first performance/installation, Branch Prop, in Strasbourg, France. Upon returning to Rhode Island in 1976, Rizzo began exhibiting temporary, site-specific work in numerous local and regional festivals. Rizzo’s work is found in many private and public collections including the Rhode Island School of Design (RISD) Museum, the John M. Bennett Papers, Washington University in St. Louis, Missouri and the Bern Porter Mail Art Collection, Getty Research Institute, Research Library, Special Collections and Visual Resources, Los Angeles, CA. in 1992 he was commissioned to create ceremonial ground-breaking shovels (GroundBreakers) for the Daphne Farago Wing at the RISD Museum, which were realized in collaboration with blacksmith George Martell. By 2005, Rizzo’s work could be seen as part of Trashformations East, which began at the Fuller Art Museum, Brockton, MA, and travelled to The Ohio Craft Museum, Columbus, OH, The Lancaster Museum of Art, Lancaster, PA, and The Copia Museum, Napa, CA and culminated with a solo exhibition, Shrines, Icons and Spirits at the Newport Art Museum, Newport, RI. Rizzo has collaborated with Rhode Island’s premier modern dance company, Island Moving Company, working with choreographer, Daniel McCusker (Field Work, 2001) and Bessie award winning choreographer, Tom Pearson (Marrow, 2012). In his role as a local government arts administrator, Bob was the driving force behind over 30 years of public art and arts programming, created and displayed in and around the state of Rhode Island; and inspired many others to create exhibitions of temporary public art worldwide. A recipient of many individual grants and two fellowships in the New Genres category from the RI State Council on the Arts, Rizzo has been guest critic at the Rhode Island School of Design (RISD) and a visiting faculty in Performance Art at both RISD and The School of the Museum of Fine Arts, Boston, MA. He was the Director of the Office of Cultural Affairs for the City of Providence, RI, from 1987-2003, and in that role founded the Convergence International Arts Festival. Convergence placed over 300 temporary public artworks throughout the City of Providence during its 15-year history. In 1998, Rizzo received the Business Volunteers for the Arts/RI Arts Advocate Award for the dedication to arts advocacy and work in creating opportunities for individual artists. 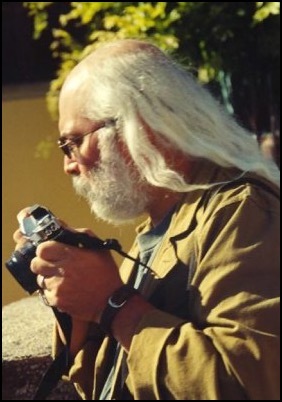 In 2000, he was awarded the Landscape Design/Open Space Award by the Providence Preservation Society for Convergence 2000, as well as the highest honor of the Rhode Island Economic Development Corporation, Division of Tourism, “The Rhode Island Tourism Achievement Award”, recognizing the expansion of the Convergence 2000 International Arts Festival into a statewide arts celebration. In 2003, Rizzo was selected as a Rhode Island Foundation Fellow for his organization. Rizzo retired from his arts administrative career in 2004 to rededicate himself to his own art. He is presently engaged in creating artwork utilizing found objects and plant matter in exploration of the nature of organic decay, change, the abundance of detritus and role of the spiritual in everyday life.